Sally's Seafood in San Diego, is known, shockingly enough, for seafood. But her Sunday brunch is equally impressive, especially when anchored (no pun intended) with this signature breakfast creation. Place butter in the skillet and put in the oven to melt the butter. After butter has melted, about 3 to 5 minutes, remove skillet from oven. Evenly sprinkle blueberries over the butter; set skillet aside. Let sit for 15 minutes then add sparkling water. Bake for about 20 minutes, or until center is set. Dutch baby will puff while baking and edges may curl up; this is normal. If using fresh berries, you may need to reduce baking time because they release less water than frozen. 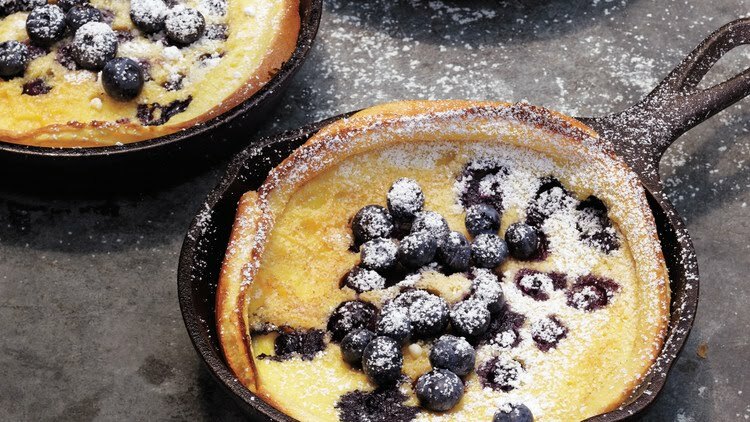 Serve blueberries on top and dust with powdered sugar.